Test all custom made label stock with the intended printer before ordering large quantities! Primera’s TuffCoat High Gloss and Semi-Gloss label materials have been specifically designed to be highly absorbent to allow water-based inkjet inks to dry quickly. While providing for immediate smudge-resistance after printing, this characteristic also makes the sheet receptive to certain airborne contaminants and could result in a discoloration of unprinted areas. Proper testing in the final application environment is strongly recommended, especially when used on or near products with aromatic vapors or products containing volatile solvents. As with all pressure sensitive materials, this product should be tested thoroughly under end-use conditions to ensure it meets the requirements of the specific application. * The Reflective/Black Mark should be opaque to infared light. The mark should be between the labels. The end of the mark should correspond with the beginning of the label. **There are two factors that determine whether the printer will accept any particular stock thickness. 1. The ability for the printer to pull the paper through the print area. 2. The ability for the sensor to read through the backing if the sensor is set to die cut. 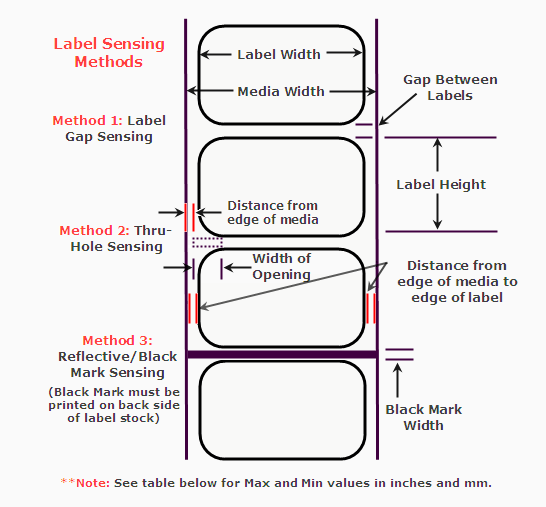 If you are printing in continuous or reflective label sensing mode number 2 does not apply. The fact that the printer must read through the backing in die-cut mode will limit the thickness much more than the printers ability to pull the paper through the print area. However, if you adjust the opacity level of the liner enough to allow the label to be seen by the stock sensor, the thickness will only be limited by the printers ability to pull it through the printer area. For these reasons the weight or thickness of the liner is a variable that cannot easily be defined. Primera recommends and uses 40# liner with all label stock. It is important to test all label stock with the intended printer before ordering large quantities!